Josette here with another Tuesday Installment: Todays' card is just plain cute!! This is a fairly simple card with a big bang happy! So let's discuss how I made it and the product used. This is a 5.5" square card. The base layer is white cardstock. The Mat, is a piece of watercolor paper. I randomly dropped Distress reinkers onto my craft sheet, misted with water until very thin, and dragged my paper through the puddles. Once dry, I enhanced by further misting with water and letting dry. I usually created several back grounds at a time, trying out different color combos. Then when I need a base, just pull out the stack and go from there. The image is from February Release: Cool Penguin. I used Classy Circle Frame and coated it with Enamel_Powder_ENCHANTED_AUBERGINE. Using a circle die, cut out the Penguin just slightly larger than the opening and glued in place. Added a circle of fun foam to the back. Stamped the Birthday greeting from: Kitty_Sweets_Clear_Stamp in black ink and heat embossed with fine clear embossing powder. 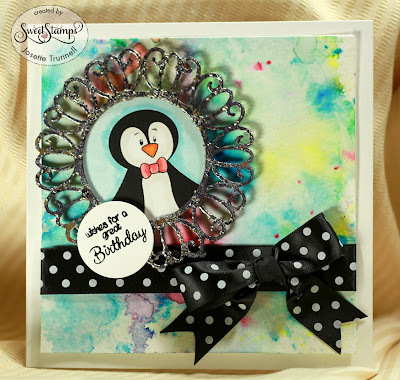 A black and white polka dotted bow was all that was needed to finish this card. The Penguin was colored with Copics. I used W0 to add shadow and R24 for the Bow with R27 for shadow. Ready for mailing!!! Hope you enjoy my Happy Penguin Card, Come back next week for more card ideas! So cute, I love how the penguin looks peeking out of the enameled frame. Love the polka dot ribbon too.